Dr. Nelson delivering the keynote address at BioVision Alexandria. The BioVision Alexandria conference convened at the Bibliotheca Alexandrina, in Alexandria, Egypt this past April. The Bibliotheca Alexandrina is a commemoration of the Ancient Library of Alexandria and an attempt to rekindle the global cultural and scholarship role of the library. With this backdrop, BioVison joined scientific and other leaders spanning disciplines to meet and listen to presentations on the most pressing challenges relating to poverty and human health. Among the distinguished participants was JCVI president, Karen Nelson, PhD, and senior scientist at JCVI and associate professor at the American University in Cairo, Ahmed Moustafa, PhD. Dr. Nelson meeting with BioVision conference participants. In her keynote speech, Dr. Nelson spoke broadly about the impact of genomics and advances in microbiome research that may have significant impact on our ability to achieve and sustain these goals. Dr. Nelson also met with next-generation scientists, MS and PhD students from the Middle East and Africa and discussed topics from scientific and technical to career advising and opportunities. Dr. Karen Nelson and attendees of her lecture at the American University in Cairo. Other conference topics included open data, precision medicine, drug discovery, environmental genomics, synthetic biology, as well as the supporting framework provided through policy and economic reforms. The conference also focused on the need to foster scientific discovery in developing countries. Of the 25 represented nations in the speaking lineup, about half were developing countries. 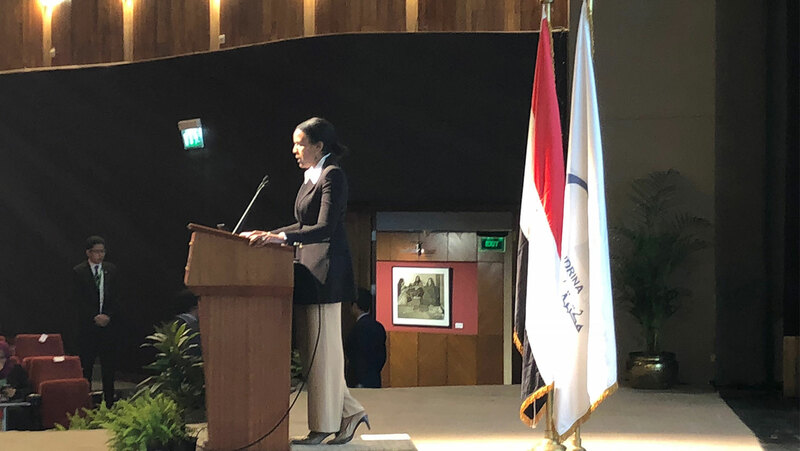 After the conference, Dr. Nelson visited the American University in Cairo (AUC) in New Cairo where she gave a public lecture on genomics and health. The lecture went over the history of genomic technologies and discoveries and the envisioned future role of genomics in clinical diagnosis and therapeutics. During her visit to AUC, Dr. Nelson met Dr. Yehia Zakaria Gad, the head of Ancient DNA in the Egyptian Museum. They discussed several potential venues of collaboration between JCVI and the Egyptian Museum. Dr. Nelson also joined Dr. Hassan El-Fawal, Dean of AUC’s School of Sciences and Engineering, and graduate students from the engineering and sciences departments for a discussion on the critical role of bridging communications between scientists and engineers to advance improvements to the quality of human life.